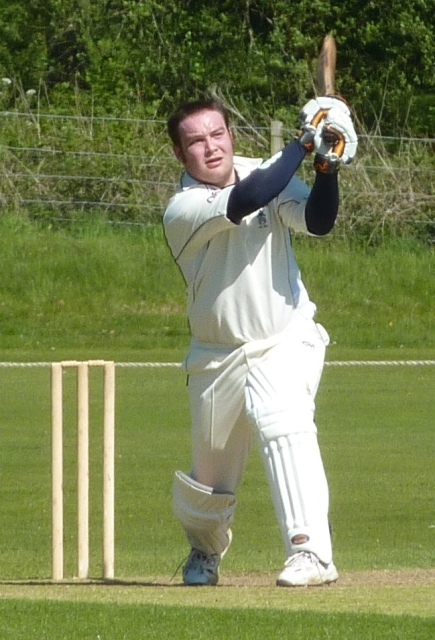 Skipper Stuart Corbett-Byers had a successful day with the bat and behind the stumps. With both Dumfries league fixtures cancelled on Saturday the focus was on the double header of 20/20 matches at Selkirk on Sunday. First was the Murgitroyd Borders 20/20 semi-final against Gala. Dumfries put Gala in to bat and Davie Davidson, Robert McBride and Josh Geary took early wickets to put Gala on the back foot at 22 for 3. Then four wickets fell in the thirties with Jerry Goodin taking two wickets in his first over. The Gala innings was finally closed out for 62 with Davidson taking three wickets. Dumfries lost two early wickets but Drew Dawson (33no) and Stuart Corbett-Byers (25no) produced a match-winning partnership and hit the winning runs in the fifteenth over. Dumfries then took on Selkirk in the Borders final. Campbell Potts hit 31 for Dumfries in the final. Davidson with 33 provided the backbone of the Dumfries innings. From 73 for 4, Campbell Potts and Josh Geary took the score to 118 and Potts was finally bowled for 31 in the last over for Dumfries to reach 130 for 6. Selkirk had reached 27 after just four overs when McBride dismissed Fenton thanks to an in-form Corbett-Byers behind the stumps. That put Selkirk on the slide as Chris McCutcheon took more two wickets. Dumfries applied the pressure taking still more wickets and spinners Goodin and Brotherston took the last two to end the final with Selkirk on 56 all out. As Borders winners Dumfries go through to the Scottish Twenty20 semi-final in Glasgow on the 25th. On Saturday, APD Dumfries travel to Freuchie in National League Division 2. JMS Nunholm are at home against GU Staff in Western Union Division 2. On Sunday Site Electrical Dumfries play Kelburne away in the Strathclyde League. Also on Sunday Nunholm hosts the Scotland U17s in their match against Cumbria.